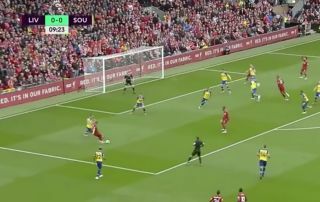 Liverpool took the lead against Southampton in their Premier League clash at Anfield, as the Reds scored one of the luckiest goals you will see this season. Jurgen Klopp’s side scored the first goal of the game in the 10h minute, as a shot from Xherdan Shaqiri cannoned off of both Shane Long and Wesley Hoedt before rolling across the line. The goal is one of the most fortunate you will see this season, as the ball took two heavy deflections before finding it’s way into the net. Goal yang di proses oleh Shaqiri.